With the publication of a recent Zinda editorial on the role of the Patriarch of the Church of the East, Mar Dinkha IV, in the politics of the Assyrians, an intensive debate about the involvement of the bishops and patriarchs has raged within the ranks of the Assyrian clergy and politicians. As we dive more deeply into the struggle to form a united political front in Iraq, calls for unity resonate everywhere from Mosul to Washington to Sydney. Equally effective are the disruptive voices of a few 'bad apples' who contend that such a unity will come as a detriment to the future of the Chaldean Catholic Church in Iraq (see Zinda's last editorial). 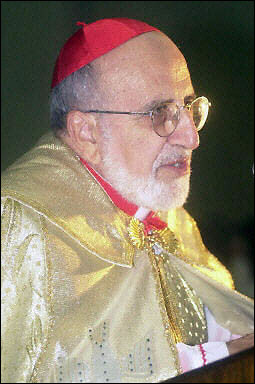 During his visit to the United States and meeting with Mar Dinkha IV, Mar Emmanuel Delly, patriarch of the Chaldean Catholic Church in an inspirational speech issued a statement in which he explained the necessity for the Church to respond to such issues as lack of unity and bias among the followers of the Assyrian Church of the East and the Chaldean Catholic Church. Both patriarchs asked that the political parties active in Iraq to move ahead with their plans for unity and progress of this unique and single nation from which all Syriac-speaking Christian denominations emerge. The Chaldean patriarchate sees that it is its duty before our country [of Iraq] and nation to express itself in the current situation in which our beloved country is crossing, specifically when it relates to the Chaldeans' position in the new Iraq and their role and participation in its rebuilding. The Chaldeans are the descendents of the ancient people of Iraq; its land has been their home for thousands of years. Their forefathers embraced Christianity since its dawn. Their monasteries, churches, cities, and villages filled up Iraq's plains and mountains. They, according to their population and roots in Mesopotamia, represent today the third ethnic nationality in Iraq after the Arabs and the Kurds. Their civic, cultural, and administrative presence is vividly clear throughout the country and across its historical periods. We hereby demand the Iraqi institutions to respect the Chaldean ethnic nationality, its position, weighed within the modern Iraqi ethnic nationalities, and allow them to participate through the role that belongs to them in their country. We request here in particular the registration of the Chaldean ethnic nationality in the place that it deserves immediately after the Arabs and the Kurds in the wording of the modern Iraqi permanent constitution. In addition, it must be pointed here that the ChaldoAssyrian designation mentioned in the Iraqi Transitional Administrative Law was nothing but a political expression for the desired coalition intended between the sons and daughters of the Chaldean and Assyrian nation. Finally, we would like to clarify here that the Chaldean nation is not represented but through its own sons and institutions by reverting to the Chaldean patriarchate, their only historical authority. Mar Delly's letter addresses two ambitious points: the recognition of a Chaldean ethnicity as a separate identity from that of Assyrian and the establishment of a millet-like role for the Patriarch as the temporal and spiritual leader of the Chaldean people in that country. At this juncture as we stand only a few steps away from consummating a historic unity among the various peoples representing our nation, the most formidable challenge to our efforts appears to be the Chaldean Catholic Church in Baghdad. Mar Delly, influenced by a few misguided Kurdish propagandists, believes that Chaldean politicians and civic leaders in Iraq, Europe, and the United States, are not capable of handling their own political future. By spending only a few hours in Michigan, for example, and observing the vast accumulation of political experiences and financial wealth of the Chaldeans, it quickly becomes evident that the isolated patriarch in Baghdad is giving little to no credit to this influential segment of our nation. The demand for political representation and temporal leadership of our people any where by a religious figure is an insult to our political will and national identity. No patriarch of this nation has the right to demand or assume the secular leadership of this nation and degrade our political struggle in the homeland or the Diaspora. A demand to have our political future rolled back to that we lived under in the Ottoman Empire is irresponsible. Frankly our patience is exhausted with these monthly correspondences between the Chaldean Catholic Church and the government in Baghdad. We realize that our patriarch in Baghdad is under pressure from the Kurdish groups financing his churches in the north to enforce a separate identity in the Iraqi Constitution, but we expect more from the bright Chaldean men and women to take on an even more direct role in conducting the political affairs of our nation and move us toward a common destiny as one people. Without this Mar Delly finds himself isolated and unable to face the insurmountable strain placed upon him by anti-unity forces within his ranks and the Kurdish parties. The role of our Churches in pushing toward unity is indispensable and carries risks, in particular for our religious leaders in Iraq. But we need strong advocates for unity from within the Chaldean Catholic Church. We may not agree on a common name today (and we should not misuse our time on this issue right now), but we can agree on the increasingly important role played by our political parties in collectively making policy and establishing a singular authority on all issues facing the Assyrian, Chaldean, and Syriac components within our nation. Providentially, some brilliant Chaldean business and civic leaders in Iraq, Michigan and California are quickly gaining political stature. Prominent among the progressives in Iraq are indeed Chaldean-Assyrians, working in various Assyrian political and Iraqi municipal roles. Mar Delly's letter received at Zinda office this week is a defeated maneuver by the Kurdish-backed Chaldean bishops in the north and a bid to supplant the increasing power of the Chaldean political groups outside of Iraq. The gap between the bishops leaving politics to politicians and those desiring a greater secular role is widening. Hence today, more than ever before, a fuller involvement of the lay Chaldeans, civic leaders and youth, women and artists, is essential for the safeguarding of the complete union of every denominational and ethnic component that make up our great nation. Ours is a story of success and survival remarkable for resilience, persistence and strength. Suffering through centuries of persecution, discrimination, and near annihilation, the people of Assyrian/Chaldean/Syriac heritage (“ChaldoAssyrians”) have been triumphant in retaining a unified culture and heritage and accepting Western inspired values of tolerance and opportunity. We are only now beginning to understand that the situation in Iraq, the last remaining area with sustainable and significant numbers of indigenous ChaldoAssyrians, has come to a point of crisis critical to our future survival. To move forward beyond decades of dissipation, separation and suffering, a new level of political and organizational sophistication is necessary to effectively pursue the policies, interests and goals we believe are necessary, namely: the survival, the improvement and the social and economic success of the ChaldoAssyrian people, organizations and communities. Although the current situation in Iraq is dire, we believe that as long as we have brave men, women and children remaining firm in their resolve to face the current crisis, there is a chance. Our collective efforts, both in Iraq and in Diaspora must now be directed in an urgent and positive manner, in an atmosphere of mutual respect, Christian unity, and with a determination towards acquiring and keeping those basic human rights guaranteed to us under international law and the rights of indigenous native peoples accepted by civilized nations and by human decency. 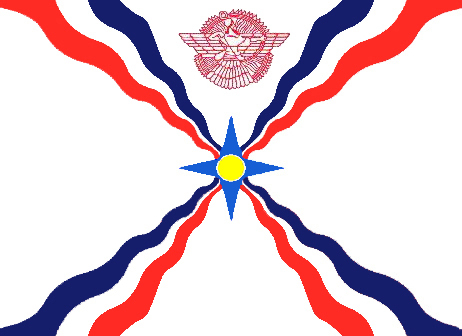 The ChaldoAssyrian National Council of America (CANCA), a registered 501c(4) organization in the U.S., was formed in late 2004 at the urging of representatives of the United States government for ChaldoAssyrian advocates, Assyrian, Chaldean and Syriac, to speak in one voice and through an identifiable and recognized body. CANCA functions as a civic and social welfare organization addressing matters of public policy and political purpose for the common benefit of all Assyrian/Chaldean/Syriac people in Diaspora and those in the indigenous lands of Iraq, Iran, Syria and Turkey (Beth-Nahrain/Mesopotamia). 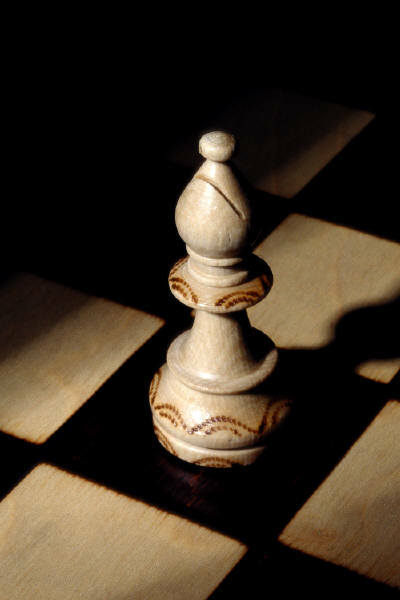 There are vexing issues facing our people and in order to develop a group that is recognized by other nations as “one” that is strong, effective and deserving of the help and attention we seek, only one option remains for us: unifying our effective organizations and individuals toward a common purpose. We aim to deliver a unified voice through the American political processes at the level of federal and state government; to support Assyrian/Chaldean/Syriac organizations in Iraq; to educate the American public on issues concerning the social, economic and political welfare of our people; to promote and manage, in consultation, coordination and concert with other Assyrian/Chaldean/Syriac social, civic, business and political organizations and leaders, a unified voice in raising issues and causes with the United States federal government; to promote an active interest in good government and civic affairs; to inspire respect for law; to promote patriotism, good relations, tolerance, and international accord and friendship between our people and others. We invite your attention to the urgent statement here enclosed, and ask for your careful consideration and support. We hope that our dedicated and diverse national leaders, civic activists, business and religious leaders and all those concerned with our survival as the descendents of one of the greatest of ancient civilizations will make our community truly proud by uniting with purpose. We are the last Aramaic speakers, among the earliest Christians, and the barometer of whether democracy and freedom will succeed in Iraq. To add your support and endorsement to the growing list of Assyrian, Chaldean, and Syriac organizations that join to forge a hopeful future, please contact CANCA’s coordinator, Jacklin Bejan at (408) 482-1949 or via e-mail at jbejan@kemsafe.com by no later than July 6, 2005. ChaldoAssyrian National Council of America, Inc. The world at large recognizes the importance of the current situation in Iraq. Less well known is the crisis we Chaldeans/Assyrians/Syriacs face, a crisis in which events will determine whether our people will survive in one of the last nations of our indigenous homeland where we retain a sustainable population. No group is more crucially influenced by the constantly evolving events in Iraq than the Christians of all the Middle East. Of these Christians, most directly involved are our own community members – the ChaldoAssyrians – the largest compact Aramaic-speaking community left in the world. 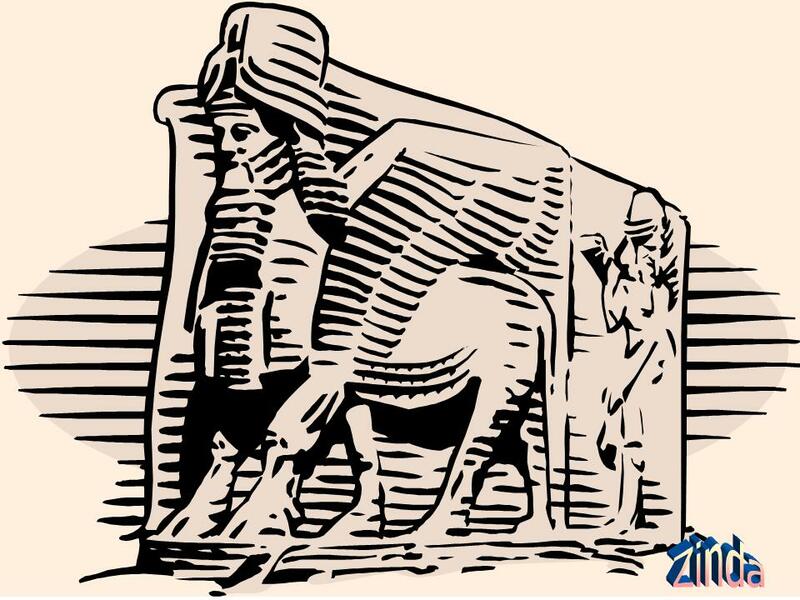 We have a brave and courageous history in our homeland as holders of the ancient heritage of early Mesopotamia. Since the First Century after Christ our steadfast allegiance to our Eastern form of Christianity, our particular Syriac heritage, and our unyielding cohesiveness in the face of persistent attempts to force our people away from their traditions and social coherence have helped us form strong reliance on both our religious ideals and our civic and ecclesial leaders. Since the beginning of the last century our people have been faced with horrible waves of violence and persecution, war and discrimination. Today, we face a terrible crisis – one that will determine whether there shall remain a future for native Christian populations anywhere in the Middle East, particularly in Iraq. The ongoing events in Iraq leading to this political/security crisis cannot be either ignored or accepted without the participation of Iraqi Christians. Our people, as one nation, require not only the dedication and continued perseverance of civic activists, but also the focus of the hearts and minds of our religious leaders and institutions. Accordingly, at this critical juncture, we turn to both our civic and ecclesial leaders to demand that actions and speeches deepening the communal divisions that weaken us as a people be brought to an end. Divisions encouraged by such acts and speeches are exploited by those seeking to remove our people as a force, both inside and outside Iraq. We should not be driven to choose sides when no sides should exist, and our communities should not work against themselves. There is action that must be taken with a unified purpose so that we may survive in Iraq. We must work with each other and achieve the interests of our people, not of those who gain by our decimation. We recognize that only with a united front will we be able to assure the acquisition of political, economic and cultural rights guaranteed under international law and long due in light of our indigenous and millennia-old history in Iraq. If we allow senseless and hateful attacks among each other, and those who separate us along denominational or tribal lines, to rule the day, we will see our presence in our homeland systematically dwindle. People with a known history of attempts to cause hate and separation among our people should not be supported with resources or given public platforms to further divide. Our own people will lose hope when our leadership cannot be trusted to direct them towards unification instead of division and discrimination. Our supporters inside and outside Iraq too will come to regard the Iraqi Christians as incapable of cooperation and inclined instead toward infighting, personal aggrandizement or self-glorification. Our principles in bringing such ideals among our people, especially in Iraq are based on the employment of common sense rules of fairness, mutual respect and reciprocal exchange among all segments/folds of our people, particularly in Iraq. Such rules prompt us to respect that various designations, such as Assyrian, Chaldean and Syriac, are equal and complimentary. We recognize that these terms grow out of a long history, which for centuries fostered isolation and division. At the same time, they make us richer and bring together in a cultural unity the totality of our history and the fulfillment of our presence and the vision of our future. We further realize that as a condition for clarity of such rules of fairness and mutual, reciprocal respect, we ought to recognize the fact that the term Syriac fully and justifiably defines our common Mesopotamian heritage and particular usage of the Aramaic language. Issue a definitive statement, as individuals, institutions and cooperative groups not only against divisiveness and extremism but also in favor of unity, collaboration and cooperation. Preach the unification of our people in words and promulgate in action an urgent policy to demand that our people gain a unified category in the new Iraqi constitution; one ChaldoAssyrian people proud of their Syriac language and heritage. The Iraqi interim constitution known as the “Temporary Administrative Law” (TAL) currently achieves this by using the word, “ChaldoAssyrian” to represent the Chaldean/Assyrian/Syriac people in Iraq. Help our community outside and inside Iraq to realize that, as Christians living in Muslim-majority countries, they must resist and forcefully oppose any establishment of Islamic governance, which shall force public adherence to religious customs not our own. Urge our leaders in Iraq, religious and secular, to understand the danger of separatist rhetoric in the name of some false form of super patriotism and the danger of falling into the trap of “divide and rule” to which our community has been lately subjected. Urge and support our civic Assyrian, Chaldean, and Syriac leaders in Iraq towards building a “Unified ChaldoAssyrian Political Coalition,” with fair, balanced, and qualified representation from all factions of our community, in preparation for the next Iraqi elections. Only when we Chaldeans/Assyrians/Syriacs stand united and strong, in reciprocity and mutual respect will we be able to hold back the flight of our people from their homes and villages in Iraq. We are, in many respects, the hope of all Christians in the Middle East, for we stand as standard bearers to the beleaguered modern history of Christians in their original homelands. We, the earliest Christians and the last speakers of the language of Jesus Christ, with the help of God, through our religious and civic leaders, must unite and stand strong. Others will take courage from publicly hearing from their respected leaders what we all know to be true: we are one people, of one origin, one culture and one homeland. This is said of course, despite the minor cultural and religious distinction among our people. We nevertheless consider these distinctions as complimentary, not contradictory to our common ChaldoAssyrian identity and Syriac language and heritage. We all must therefore accept that our choices together reshape the world available to our next generation. Our actions must be more effective than those of our modern forefathers. This is a critical moment in our history and future. We can survive in Iraq in peace and prosperity and as equals proud and faithful to their one nation and common culture. We believe this is possible only through the unified action of our people. We ask you to join us. By Rev. Ken Joseph, Jr.
(ZNDA: Tokyo) A team of Iraqi parliamentarians led by Yonadam Kanna, chair of the Reconstruction and Public Services Committee of the Iraqi National Assembly, have just completed a visit to Japan. In meetings, unprecedented for a parliamentary delegation, the team met with the Japanese prime minister, foreign minister, key members of Parliament and business leaders. "We are very encouraged and hopeful that Japan's pledge of $5 billion for Iraq will make a critical difference in moving our nation forward," said Kanna. Mr. Yonadam Kanna (Left) and Rev. Ken Joseph in Tokyo, Japan. "The real problem is an urgent need for implementation and verification of reconstruction in the country," he continued. "We have many projects, for example in my constituency, which as an Assyrian Christian in the Nineveh Plain and Northern part of Iraq. In historic Assyria, massive amounts of funds have been allocated, but our people still live like in the Middle Ages, without water, roads, electricity and telephone service." "Reconstruction aid is allocated for our areas, but unfortunately local Government is not functioning in many areas. And with the security situation as it is, little if any help is reaching our Assyrian Christian villages," said Kanna. Reflecting a view that the real reconstruction problem in Iraq is a lack of verification on the ground and implementation of projects, the five day visit of the Iraqi MPs renewed a historic Iraq-Japan relationship that dates back to the days of the Silk Road when much of the culture of the Middle East flowed to China and Japan. More recently, major Japanese corporations operated in Iraq working with the oil industry until it all ended with the previous Gulf War. "We are committed to ensuring Japan's aid is used in the most fair and comprehensive way and are doing all we can to make sure it can be verified on the ground," said Tsukasa Uemura, former Japanese charge de affairs in Baghdad and now head of the Economic Assistance Bureau in Japan's Ministry of Foreign Affairs. Japan's $5 billion pledge for Iraqi reconstruction is second only to the United States and the European Union. While great concern has been expressed about the upcoming writing of the Iraqi constitution and in particular Article 7 which reads: "Islam is the official religion of the State," Kanna is also one of the only non-Muslim members of the Constitutional Committee. 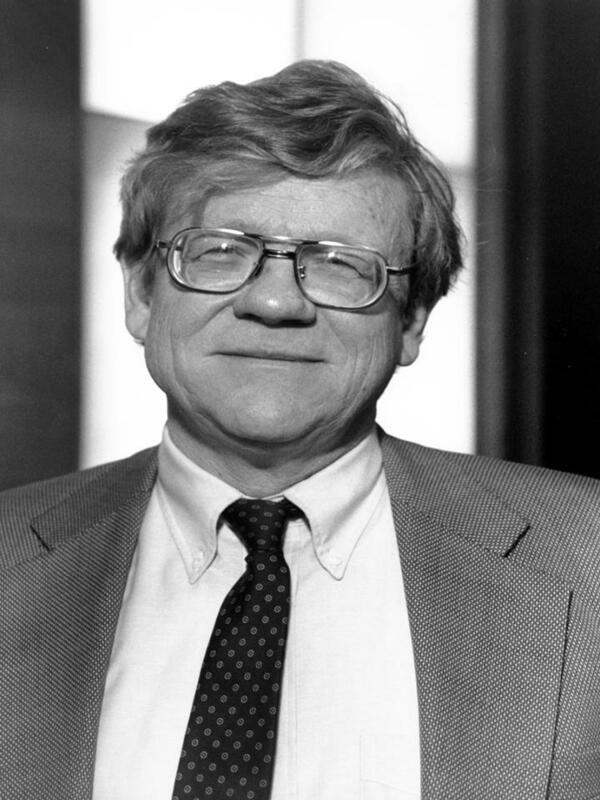 "The Constitution is being written much in the spirit of the current Transitional Administrative Law. I am confident that we will be able to achieve a secular, open and democratic Constitution that will be fair to all Iraqis. Further, I believe that this is what all Iraqis want," he said. A telling sign of whether Kanna's views will hold are the current realities in the Middle East, which has seen the non-Muslim population of the area go from nearly 20 percent to now under 2 percent as the radicalization of previously tolerant Muslim regimes have caused massive emigration of non-Muslims. Estimates of as much as 100,000 non-Muslims leaving Iraq, most of them Assyrian Christians who are the indigenous people of the country are worrying many analysts. The Japanese government, which has a strong, secular Constitution written by the United States nearly 60 years ago when it too was defeated and then occupied by U.S. forces, many believe, can be a balancing influence in Iraq gently nudging for a similar situation in Iraq. Kanna believes the Iraqi people and government are committed to democracy, the rule of law and a secular constitution. The facts on the ground where aid is routinely, according to a recent EU document, not provided to non-Muslims and a de-facto "ethnic cleansing" would seem to indicate otherwise. What is not in doubt is that the future of Iraq rests, not in the hands of the Iraqis themselves, but in the international community. In particular the major donors the United States, the EU and Japan and their ability to leverage their support for fair and verifiable reconstruction and a secular constitution that eliminates the much reviled Article 7, which states that "Islam is the Official Religion of the State." Many ask a very simple, but telling question. "Was a war fought to depose Saddam Hussein only to create The Islamic republic of Iraq against the clear wishes of the people and a constitution that states that Islam is the official religion of the state?" The sign of whether Iraq will succeed or not can be measured very clearly on two fronts. First, whether the Assyrian Christians, the "Canary in the Mine" of Iraq will remain and whether an Iraqi constitution can be produced, as recommended by the previous Constitutional Committee that includes no references to religion or ideology. (ZNDA: Baghdad) Radio Free Iraq correspondent in Baghdad, Sawsan Habib, reported on 9 June about the celebrations held at Baghdad’s Ibn al-Haytham Elementary School on the occasion of the graduation of the first class taught in the Syriac (alternative name for Assyrian) language. All the interviews can be listened to in their Arabic originals on Radio Free Iraq’s website (click here). Zinda: Mr. Kubalek is a reporter at Radio Free Europe and a Zinda contributor and Zinda Iraqi news specialist in Prague, the Czech Republic. (ZNDA: San Diego) Two Iraqi brothers were stopped by Mexican agents as they tried to cross illegally into the United States near Tecate. The men, ages 27 and 34, were detained Monday by Mexican agents as they walked toward the border in a sparsely populated area west of Tecate, according to the Mexican Attorney General's Office. Also detained were two Mexican smuggling suspects and a Mexican minor. The two Iraqis claim to be members of the Chaldean Christian minority, said Liza Davis, spokeswoman for the U.S. Consulate in Tijuana. Mexican immigration officials have flown the pair to Mexico City for eventual deportation to Iraq, she said. Just five years ago, Baja California was a major transit point for Iraqi Chaldeans trying to join their family members across the border. But the once-steady flow has dwindled to a trickle, say U.S. officials and members of the Chaldean community in San Diego. "They're coming in groups of two or three," said Raymond Barno, who interprets and prepares legal documents for Iraqis and other Middle Easterners in San Diego. "Before, it used to be a full airplane." U.S. immigration policies adopted after the Sept. 11, 2001, terrorist attacks have made it harder for Iraqis and others from "countries of special interest" who file asylum claims at the U.S. border. Rather than being released as they await their hearings, applicants often remain in federal custody for months. U.S. agents crossed to Mexico to interrogate the two men, said Lauren Mack, spokeswoman for the U.S. Bureau of Immigration and Customs Enforcement in San Diego. Background checks on the men found no criminal records or links to terrorist organizations, she said. According to a news release from the Mexican Attorney General's Office, the brothers said they were from Baghdad, where they came into contact with a person who helped them obtain travel documents. They flew to Spain, then Mexico City, before taking a bus to the border. In Tijuana, they were contacted by the smuggling suspects and the 17-year-old. The three Mexicans and the two Iraqis were walking toward the metal border fence in a rocky area known as Paso del Aguila when they were intercepted by agents with Mexico's Federal Investigations Agency. (ZNDA: Toronto) The rising fortunes of a small Scandinavian soccer team founded by factory workers have become the unlikely focus of an estimated 4 million Assyrians worldwide. Nick Dinkha, a 36-year-old Bay Street bond analyst, is one of the estimated 25,000 Assyrians in the GTA. Assyriska Foreningen Sodertalje's three-decade long progress from a weekend kick-around club to a professional side in Sweden's elite league is a sporting fairy tale. In Canadian terms, it's the equivalent of a beer-league hockey team making the NHL. But Assyriska is much more than a sports success story. The team has become the national obsession of millions of immigrants scattered around the globe. Like the Kurds, the Assyrians — a stateless nation of middle-eastern Christians who come from an area bounded by Iraq, Iran, Syria and Turkey — have never had their own country to root for in the Olympics. What they have is Assyriska. "It's our national team," says Nick Dinkha, a Bay Street bond analyst. Dinkha, 36, is one of the estimated 25,000 Assyrians living in the Greater Toronto Area (GTA). Like many of his compatriots, he goes to extraordinary lengths to follow the tiny club thousands of kilometers away. The games aren't broadcast live internationally, so Dinkha is forced to follow via Internet radio ... often in Swedish. "You don't really understand it. But you can hear the names of the players," Dinkha says. But why listen at all, if you can't follow the game? "Why do people listen to opera? They can't understand that either," says Layth Jato, president of Toronto's Assyrian Athletic Club. "For us, it's saying, `There they are.' That's enough." Assyriska was started in 1971 in the town of Sodertalje, home of tennis legend Bjorn Borg. The founders were Assyrian immigrants working at the local Scania truck factory. The name "Assyriska" paid tribute to their heritage. After four years, the team was admitted into the seventh division — the lowest rung in Swedish football. By the mid-'80s, the team had risen as high as the fourth division. In order to spur its progress, in 1990 Assyriska began admitting non-Assyrian players. "We are southern, warm-blooded people who like to run with the ball. It's good to have a couple of solid Swedes at the back," Assyriska administrator Fehmi Tasci explained to London's Observer. 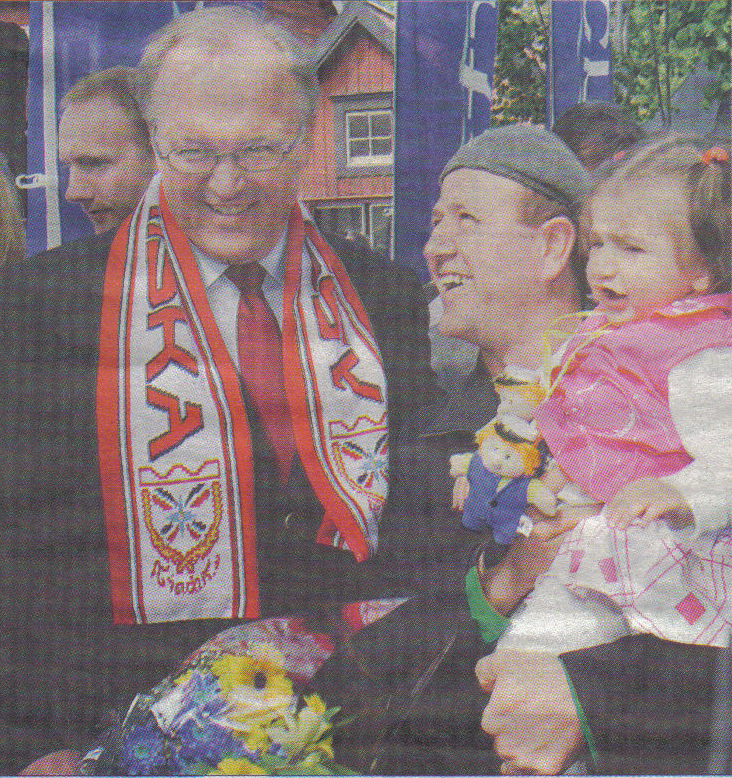 The Swedish Prime Minister, Goran Persson, wears the popular Assyriska shawl during a recent visit to Sodertalje. Last year, it made history by winning promotion to Sweden's highest league, the Allsvenskan. It celebrated by hiring a Portuguese coach to lead a multi-ethnic side populated by Assyrians, Swedes, a Ghanaian, a Bosnian and a Sierra Leonean. It began its first season in the top tier in April. It's struggled so far, winning only two of nine games. But that doesn't seem to bother the Assyrian fans much. Internet chatrooms usually filled with heated discussions about the war in Iraq now devote almost as much space to soccer tactics and Allsvenskan results. When the games aren't available on radio in any language, Swedish Assyrians update live game scores while thousands around the world huddle over their monitors. "More and more, you see people who have visited family in Sweden wearing the scarves and jerseys here in Toronto. "We're in 82 countries, but the Internet has become our home," Dinkha says. If they can wait, fans can catch post-game highlights on Assyrian-language satellite TV. Dinkha is trying to organize live broadcasts of the games at the Assyrian community centre in Mississauga. He's already bought the big-screen monitor, but he's still trying to untangle the mysteries of Swedish satellite feeds. For many Assyrians, traveling to Sodertalje to watch a game has become a pilgrimage of sorts. "More and more, you see people who have visited family in Sweden wearing the scarves and jerseys here in Toronto," Dinkha says. Hundreds converged from around the world in 2003 when Assyriska, then a second-division club, made it to the final of the Swedish Cup. Assyriska lost the game to top-ranked Elfsborg, but the highlight for Assyrians worldwide came off the pitch. As the players took to the field, fans unfurled a massive Assyrian flag big enough to cover one entire end of the stands. "When I saw that, it felt as if my country was being born," says Jato. Jato, 43, is planning a trip to Sodertalje in late July. He is helping put together a North American-Assyrian team to play in Sweden. In all, four players from each of the GTA, Detroit, Chicago and California will be chosen to play against Assyriska's senior and reserve squads in a series of exhibition matches. After its Scandinavian tour, the team continues on to Iran to play in the "Assyrian Olympics." Jato has already tapped Danny Jirta, 23, of Hamilton, as one of the Canadian contingent. Jirta has taken three months off from his contracting job so that he can work out three times a day in preparation for the two-week tour. "I'm taking this more than seriously," Jirta says. "It's an Assyrian team. I want to honour that." Assyriska's immediate challenge is surviving in the Allsvenskan. It's playing in a borrowed stadium against better funded rivals like Malmo and Djurgardens. A new 6,700-seat facility won't be ready until the Swedish season ends in October. All in all, the odds seem long. But Assyrians in Toronto and around the world are intent on enjoying every minute of the ride. Zinda: Make a fashion statement and show your support for the Assyriska football (soccer) club at any public sporting or Assyrian event by wearing the beautifully designed Assyriska shawl. We were delighted to see you side by side with Honorable Mar Dinkha, the Patriarch of the Church of the East. It gave us hope that finally the estrangement between the Chaldean Church and other Assyrian Churches in Iraq will come to an end. Your sentiments, that ‘we are one people’, made us believe that you no longer consider members of the Chaldean church to be a different ethnicity than those of the Church of the East and the Syrian Orthodox Church. Furthermore, some members of your own denomination appealed to you and Mar Dinkha to meet and agree on how the Chaldean and Assyrian organizations and churches can make a unified stand on the new Iraqi constitution. Then we learned that you wrote a letter to the Arab and the Kurd officials demanding that Members of your Church be recognized as a separate nationality, also to be mentioned in the Iraqi constitution and official records separately as the third most important people of Iraq, after the Arabs and the Kurds. To say the least we were shocked and perplexed by such a contradiction. In our presence you agree that we are one people but where it counts you claim members of your church are a nationality other than Assyrian, and ask for special privileges for them. Your letter to the Iraqi officials can only cause disunity and long lasting damage to the brotherly relations between your Church and the rest of us. It will result in dividing the Christians of Iraq and force them to compete for the disappointing pittance Arabs and Kurds are willing to give them which will cause inequalities, lack of opportunities, and unhealthy conditions that may hasten their migration from our ancestral land. That clearly is not to the best interest of the Chaldean Church nor its members. It is truly amazing that a Christian Church will treat its own people who belong to another with such injustice. This was clearly against the teachings of the Lord when he said: “Inasmuch as ye have done it unto one of the least of these my brethren, ye have done it unto me:” and He went on to say; “42, For I was an hungered, and ye gave me no meat: I was thirsty, and ye gave me no drink: 43, I was a stranger, and ye took me not in: naked, and ye clothed me not: sick, and in prison, and ye visited me not.” Yet this injustice seems to continue today when the Chaldean Church claims its denominational name as its ethnic identity to disown and reject other churches and seeks to profit at their expense. Such advantages are at best illusory and contrary to the teachings of Christ. By rejecting its Assyrian identity the Chaldean Church in reality undermines our historical claim to the Assyrian homeland and saps the strength of the Christian of Iraq, makes them adversaries rather than brethren. In the long run, it is not the Chaldean Catholics who will have advantage for this but those who seek to undermine all Christians in the Middle East. When you claim your Church members descended from the ancient Chaldeans rather than Assyrians, it emboldens the Kurds to falsely claim that the plain of Nineveh has been their homeland historically. This could have dire consequences for all of us. Surely the Catholic Church and the new Pope whose goal it is to reunite all Christians can only harm Christian unity and Christianity. Your Excellency, we surmise that you have been forced to write the previously mentioned letter and have probably been pressured by a few extremists who only care about their personal profit at the expense of everyone else. We beseech you to refuse to follow their lead and pray to our Lord for guidance on the Christian thing to do in this matter. Your church’s denial of its Assyrian ethnicity will not bring honor or advantage to the long-term interest of our people. It will instead deprive them of their rights as the indigenous people of the plain of Nineveh. Let us not confuse religious affiliation with national identity. 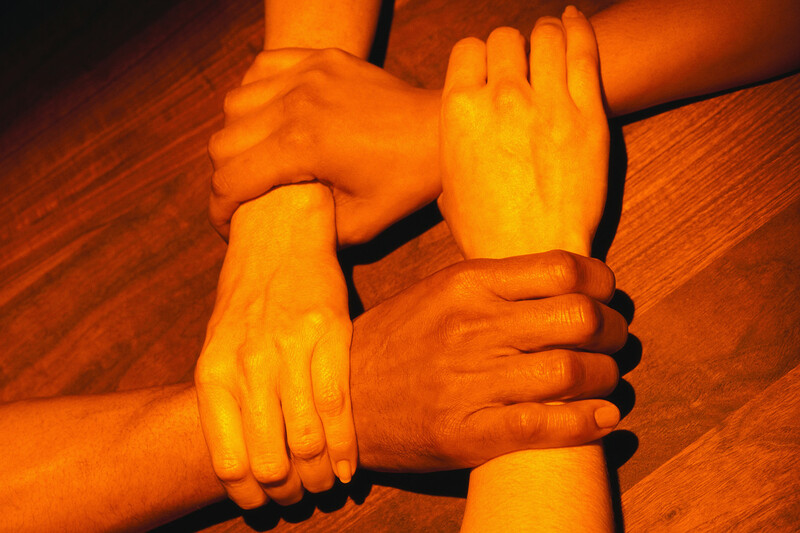 There is wisdom in the saying, United WE Stand and Divided WE Fall. Mr. Yonadam Kanna, a representative in the Iraqi National Assembly and chairman of the Reconstruction & Public Services Committee of the Assembly speaks at a gathering of the Assyrians in Dubai. 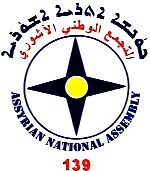 On Thursday the 23rd, June, a group of Assyrians in Dubai had the pleasure of meeting with Mr. Yonadam Kanna, The General Secretary of the Assyrian Democratic Movement, Representative of the ChldoAssyrians in Iraq and Chairman of the Reconstruction and Public Services Committee of the National Assembly, Republic of Iraq. Upon requisition of the Assyrian Community in Dubai Mr. Kanna made a stopover for two days in Dubai while he was on his way to Iraq returning from an official visit to Japan. A committee comprised of Mr. Clifford Kelaita, Mr. Ward Zai, Mr. Emanuel Kelaita and Mr. Aprim Shapera organized a dinner evening at the City Centre Hotel – Sofitel, and the participants of this event had the opportunity to meet and listen to Mr. Kanna. At the beginning, a welcoming speech was given by Mr. Emanuel Kelaita. On behalf of the Assyrian Community in Dubai, he expressed their grate appreciation and thankful to Mr. Kanna for sparing a day from his very busy time to meet Assyrians in Dubai. Mr. Kanna sitting among the Assyrians who attended a dinner meeting in his honor in Dubai, United Arab Emirates. In his speech, Mr. Kanna explained the democratic process in Iraq, paradoxical incidents and ambiguities that adhered to the Iraqi elections, the roll of our people and their national rights, and the prospective of security and stability in Iraq. This dissertation was very welcome, as some of us did not quite understand all that is involved in the whole process. He also explained what is more important to us, the situation of the Assyrians in the different villages, towns and regions of Iraq. Mr. Kanna took time in answering very clearly some questions posed to him by different persons. 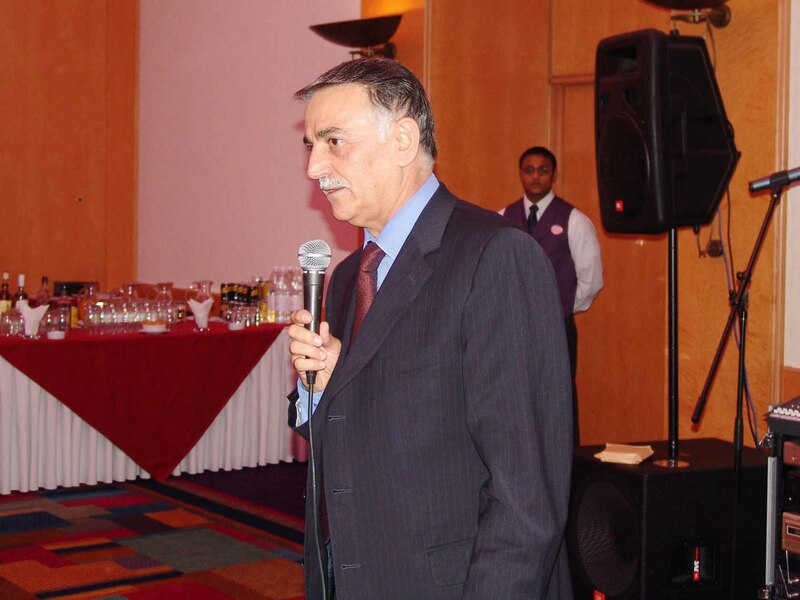 He later spent some time at each table, meeting old friends, answering abashed questions, greeting acquaintances and getting to know other members of the Assyrian Community in Dubai. It was a memorable evening in which Assyrians had the opportunity to socialize, learn more about their brothers’ circumstances in the Homeland, about Iraqi current situation and enjoy drinks and the excellent food that the buffet provided. I hope that we will be able to meet again with Mr. Kanna, not in Dubai but in Bet Nahrain and continue learning firsthand about the situation of our Assyrians in the motherland. His visit to France was a national event: he had a meeting with President Jacques Chirac and with all the French clergy. Since Mar Delly left France, we have no news from him. Every monday and every Friday I open Zinda hoping to get some news, but the only information I get is his critical of the US evangelists in Iraq. I am frustrated because I want to know what did Mar Delly in the US, how many time he stayed, who he met, what he said, when he lived, where he is now (Australia, New Zealand, Iraq?). Mar Delly visiting the diaspora around the world is an important event. Please Zinda and Zinda readers, inform us ! This is a short response to Ann Margaret Younan's piece titled "Pride and Prejudice" posted in the last issue of Zinda. Allow me to begin by stating that if Ann Margaret found the title of my article “The Hallucination of the so-called Moslem Assyrians,” offensive, then I wish I knew the degree of its offensiveness because if that fact is seen as offensive then I would have liked to know the way to kick it a notch further. I do not think that one can fool the educated readers of Zinda by applying idealism in a world that is non-ideal. Ann might apply her idealism within the premises of her home; however, the reality on the ground is completely different. The intention of my article was not to compare between religions or to show that one particular religion was better than the other was since I made that clear from the beginning. However, I just wanted to make sure that we kept certain historical facts into consideration when addressing the Assyrians' picture during Islam. The 50,000 or 100,000 Arab Moslems who came out from the Arabian Peninsula and stormed the Fertile Crescent some 1,360 years ago, did not wave white roses at the predominantly Christian, atheist, or pagan population. They had a clear objective. The objective has been met since Christianity (and many other religions) has almost completely disappeared from that region. That does not reflect the idealism of Ann Margaret; that is the unfortunate reality. I could foresee what those few ultra liberals would say next; they are going to remind us of the Crusaders. Well, the topic at hand is Assyrians, their experience with Islam, and the claim that so-called Moslem Assyrians existed. That is the subject. Nowhere in my article I claimed that only Christians were good people. Why did Ann bring that issue? Nowhere in my article I claimed that all Moslems were bad. Why did Ann bring that issue? Ann spoke about love and the message of peace and no one would raise any objections there. Still, she needs to be reminded that the reality is that our world is far from being there. Ann goes on to manipulate what I stated and insinuates that I do not understand that there is non-Arab Moslems, which was silly. The reason for mentioning the Islamic based Arab culture in particular was because Assyrians lived in northern Mesopotamia and initially they had to deal with that culture after Islam spread in Mesopotamia. Still, I need to remind Ann that the Mongols had Nestorian Christians among them and they tolerated the Nestorian Christians in Mesopotamia. However, the moment the Mongols converted to Islam, they began to persecute and massacre those same Nestorians whom they tolerated earlier. How does Ann explain that? Did you really understand the history of the Middle East in the last 1,360 years and the affect of Islam on Assyrians? For all practical purposes, are there Christian Turks in Turkey? Are there any Christian Arabs in Saudi Arabia? Since there are not, why? What happened to the Christian Arabs in Iraq and the Syrian Desert? Why were they not left alone to remain as Christian Arabs? Why did they have to become Moslems? What happened to the majority of the non-Arab ethnic people of Libya, Tunisia, Algeria, and Morocco for example? Why weren't they left alone to be who they were and to practice their pre-Islamic religion? Did the forefathers of these people convert to Islam voluntarily? The point of my article, and the above questions, was centered on the historical facts that have proven that in the final analysis, none Moslems could not survive under the direct rule of Islam. One must understand Islam and the concept of Moslem nation and its relation to Arabs (again, I understand the presence of non-Arab Moslems around the world) in order to be able to answer the above questions. My concern is only with the Assyrian experience and not other nations. Ann claims that in Iraq today, millions call for a secular Iraq. Whether that is the case or not means nothing, one must not confuse history with politics. One must not confuse the policies dictated by the USA or policies intended to polish certain images with what had happened in the last thirteen centuries. It is funny that Ann refers to Rev. Joseph who claims that millions of educated Iraqis are calling for a secular government; however, she does not quote what Rev. Joseph has been warning from all along, i.e., an Islamic state in Iraq based on Islamic Shari'aa. It is funnier that Ann continues to claim the possibility of coexistence of the three main religions in Iraq. Still, she then brings the example of the Jews fleeing Iraq, which proves my point as Judaism disappeared from Iraq and Christianity is following. Whether that disappearance was due to modern politics or not is beside the fact. The fact is that Islam and Arabism go hand in hand; they are synonymous. All religions in Iraq beside Islam will disappear whether through the prior reason or the latter unless something drastic takes place. Finally, Ann builds a scenario of secular Assyria when answering my concerns, a scenario that does not exist. Therefore, all her answers are non-practical and theoretical. "… that they [all religions] are all the same in their message, and all are rooted in the ancient Assyrian belief system." "We can say all [religions] came from one source and one place: our beloved nation, Assyria." "Ultimately, this code [Hammurabi's] gave rise to Judaism, Christianity, Hinduism, Islam, and Buddhism." "If the people of Mesopotamia were all one, as Genesis tells us, then Assyrians of today are Moslems, Christians, and Jews." "…(Christianity, Islam, and Judaism) will one day co-exist peacefully." "When you have Moslem Assyrians, Jewish Assyrians, and Christian Assyrians in a society, you essentially have a Shari'aa Law that is ineffective." In the end, I just wonder in what world Ann Margaret Younan is living. I am sure though that it is not the earth. At a meeting of twelve Assyrian Chaldean Syriac Organisations held in the hall of Nineveh Club in Sydney, Australia on Sunday 26th June 2005, the first Council for the Assyrian Chaldean Syriac community in Australia was established. The meeting was called for and arranged by a working group and was attended by thirty representatives of social, political and cultural organisations, representing the majority of our Chaldean Syriac Assyrian people in the city of Sydney. 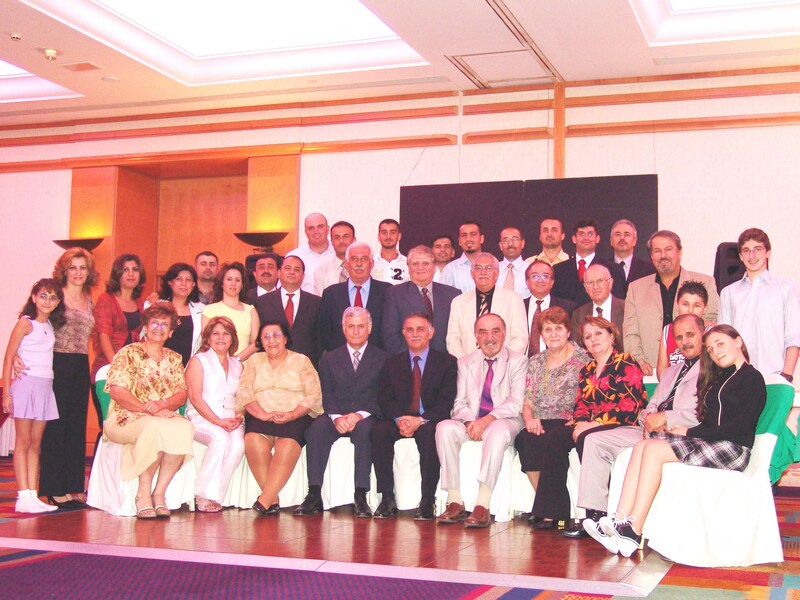 The working group, which was composed of individuals who volunteered to work diligently and actively for ten months, had sent a “Questionnaire” to twenty seven Syriac Assyrian Chaldean organisations representing our religious, social, cultural and political spectrum in the Australian society. They were asked for their point of view regarding participation in establishing a council for the community in this country. The majority’s response was in the affirmative giving the council the tripartite name. A few others insisted in using a single name pertaining to one side without taking into account the feelings of the second and third side, and any concern for the unity of the community and protecting it from division, grouping and seclusion each on its own. Furthermore, all the religious organisations concurred to leave religion apart from this council, but they all blessed this work and aided this idea. At the conclusion of this meeting, all the attendees resolved to establish a “Preparatory Committee” from among the working group itself in addition to some other individuals representing the participating organisations in this council, to inscribe a constitution and by-laws for the council, which will be presented for discussion and endorsement by all, following its completion. Finally, it was unanimously resolved to start the procedure of registering the council officially with the State Government’s Registration Department, and to begin declaring it and commencing its activities as of the date of the 26th of June, 2005; and it has actually been registered officially. We ask that the Almighty will guide us all forward. It is our pleasure to announce that a new interagency called the Assyrian Youth Network has been established for the Assyrian organisations interested in working with the Assyrian youth. The Assyrian Youth Network comprises of representatives of the Assyrian organisations who in some capacity work with young Assyrians and wish to plan activities for them. It is a meeting point for planning, sharing knowledge and resources so that each organisation is able to best serve young people in its own way. Currently, we have interested members from cultural, sporting, religious and academic organisations who attend our meetings. Although the Assyrian Australian Association has worked to set up the network, the network itself is not under the auspice of any specific organisation. The network aims to be open and inclusive. A draft terms of reference for the network has been circulated to organisations in the Sydney area, as well as a draft youth planning document. As the Assyrian Youth Network encourages participation in the planning process, these documents will be finalised once feedback is given by participating organisations. The Assyrian Youth Network hopes that your organisation will bring its unique strengths and experience to the interagency for the benefit of our community’s young Assyrians. If you are “baptized” on Nusardil Day, grin and bear it with a chuckle! Nusardil or “Musardy” or “Nusardy” as popularly called, is a water festival, one of the many traditional feasts observed by the Assyrian people. It is celebrated in summer. People, particularly young ones, go around with water-filled receptacles of various shapes and sizes and sprinkle or splash each other. Even non-Assyrian strangers are not spared. They often catch their “victims” unaware by sneaking up on them. Although those wetted are often startled out of their skin, they are expected to tolerate the “disaster” with grace, indicated by a grin or chuckle. Nusardil was a popular event in Assyrian settlements in the Middle Eastern countries. It was well observed in closely-knit communities in Iraq, such as in Gailani Camp in Baghdad, in Kirkuk, and in Habbaniya. In the latter Armenians as well as some Arab, Kurdish, and Indian children also participated. It was also celebrated in other Assyrian town and village communities, including those in Iran, Syria, Lebanon, and perhaps even in Russia. And following the Assyrian evacuation of Habbaniya in the late 1950s, the festival was celebrated in the several-thousand strong Assyrian community of Dora, a suburb of Baghdad. Although the time and custom of celebrating the event was the same everywhere, the form of practicing it somewhat differed from community to community. Normally people, especially younger ones, chased each other on the streets and in alleyways and played water on each other. Some did this individually and some in “gangs.” But in some communities where rooftops were flat and attached to each other, some people sneaked from one rooftop to the other to splash the people down below, in the yards or on the alley or street. The festival usually lasted from morning till noontime. When the sun got very hot, most participants broke up and went home. On this day the club provides hot and cold drinks and sandwiches or grilled meat for sale as well as a musical band along with one or two of the Assyrian popular singers to enliven the event. A multitude of people flock to enjoy the festive picnic. The older ones (mostly wet!) enjoy listening to song and music, watching khigga dancing while eating (or savoring the aromatic smell of sizzling and smoking kababs! ), drinking and chatting away the hours under cool shade of trees. The younger folks mainly enjoy dancing and frolicking, while the little ones have fun by chasing and sprinkling each other and screaming and laughing to their hearts’ content. The occasion is also springtime for those young men and women, whose blood is bubbling and whose hearts are brimming with elated romantic notions! The Nusardil picnic is usually videotaped, along with relevant interviews with some of the participants, and is shown on the club’s local weekly one-hour TV program. Most people enjoy the opportunity to appear as well as watch themselves on TV. 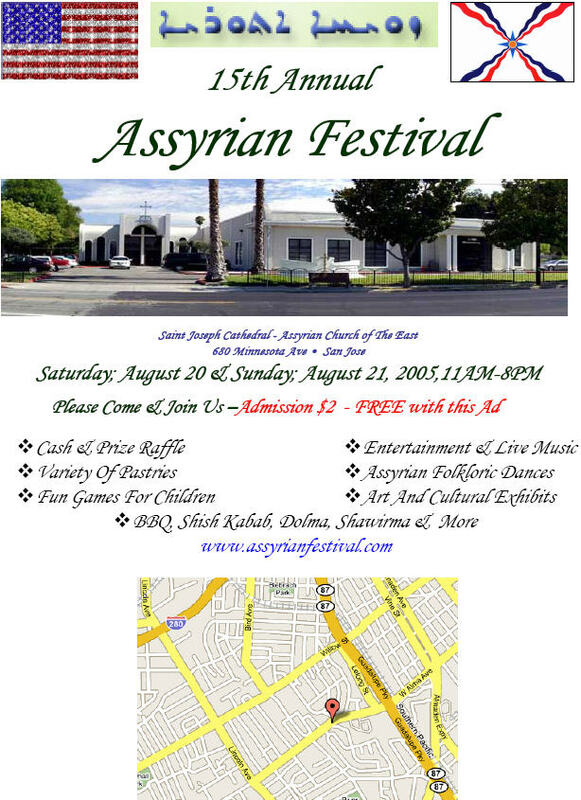 The club that focuses more on this tradition is the Assyrian American Association of Modesto. Their purpose, they say, is to promote our customs and traditions and to encourage our youth to practice them. Nusardil is observed annually. The seventh Sunday after Pentecost, it usually falls in July about 100 days after Easter. It is said that this custom is an old tradition that has come down to us from our ancestors. The ancient Assyrians had many gods—god of fire, god of sun, god of water, and so on—which were represented by different statues or symbols and were revered and celebrated in different ways. One form of celebration was by sprinkling of water. These representations were paraded in a procession through the city during national holidays or special festivals. The citizens who lined the streets to watch and to pay homage would sprinkle water on the path of the procession as a sign of their reverence, loyalty, and joy. After the Assyrians embraced Christianity, they retained, modified, and gave a Christian meaning to some of these ancient Assyrian customs and traditions during the ensuing centuries. Nusardil is one of them. When they were evangelized in the first century A.D. by St. Thomas, it is said that because of the large number of people involved, the Apostle baptized en masse. He blessed water and sprinkled it over groups of crowds. This practice may have led to the tradition of Nusardil. Baptism was, of course, initiated by John the Baptist. He baptized Jesus Christ, who in turn commanded His Disciples to go out and baptize all peoples. Apparently Nusardil is celebrated by Assyrians in commemoration of the Christian baptism. We “old timers” take the tradition for granted because we have seen and experienced Nusardil in our former homelands. But our children and grandchildren who have been born or raised in these Western countries do not know it, unless some have heard about it from their elders. But they are now learning to practice it and are enjoying it as well as absorbing its spirit. But the most important aspect of such celebrations is that we are not only encouraging our people to keep our customs and traditions alive in this country, but are also instilling in our youth the importance and value of such heritage. And coming with the territory is the opportunity for Assyrian young men and women to meet and—who knows—some might even feel the Cupid’s arrow in their hearts and hear wedding bells in their ears! Zinda: The current month of Tammuz, the fourth month of the Assyrian calendar year, is also the name of a Mesopotamian deity. Known as Dummuzi in Sumer, the lover of Ishtar is said to have spent half of each year in the Underworld until he was "resurrected" and brought to life by his lover in the month of Tammuz. This semi-annual event was celebrated during the ritual of Taklimtu and was later developed into the modern Assyrian festival of Nusardil during which water is sprayed to symbolize the safe return of Tammuz from the Netherworlds. Cartoons are provided to Zinda Magazine courtesy of Richard A. Ewan. On October 17, 1976, His grace Mar Dinkha, Bishop of Iran, is consecrated Patriarch and becomes the120th successor to the glorious line of the apostolic see of Selucia – Ctesiphon, Church of the East. A few months later, His Holiness, Patriarch Mar Dinkha IV, came to Chicago and officiated a holy mass at Mar Sargis Church, this church was the only Church of the East in Chicago at that time. Later in the afternoon right after the mass, we, the parishioners gathered in the church hall to hear His Holiness’ speech. In his inspirational speech, emphasized particularly on the importance of keeping our heritage and nationalism alive by establishing classes teaching Assyrian language along with Bible study. After hearing Patriarch’s speech, I was extremely moved. 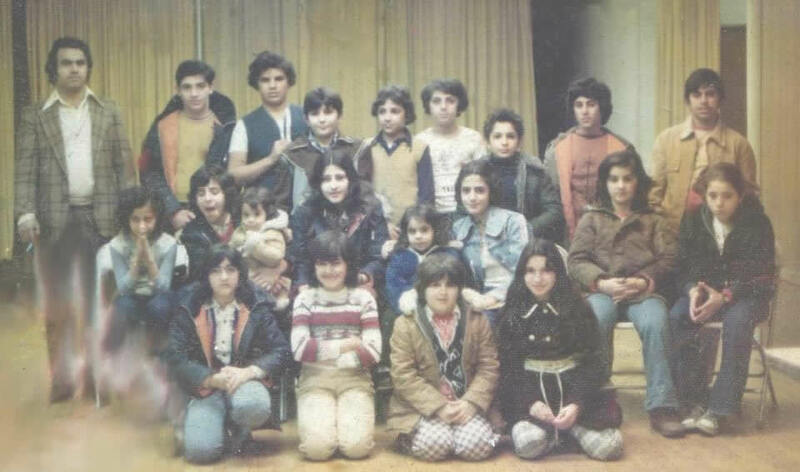 I was young in the mid twenties, member of the church choir, I immediately started registering names of youths who were willing to learn and improve their Assyrian language skills. We were later able to form two classes. Reverend Barkho Oshana (then Shamasha) took care of one class teaching church hymns, and I took care of the other. Both classes were held in the basement hall of Mar Sargis Church. Students started attending classes after their regular public schools. We were doing fine; students were very happy learning and attending classes regularly. One day in mid of February, typical sub-zero temperature in Chicago, the ground was covered with fresh snow, ten inches high. I became a little worried whether our students will make it to the school and attend classes or not. I drove by their neighborhood to see if they were around. There I saw thirteen of them at the corner of Glenwood and Winona Streets, very determined to attend classes despite of cold weather, anxiously waiting for someone to take them to their classes. I stopped to see what is going on; they all came rushing towards me, I told them to get into my car. I did not want to take half of them and leave the other half out to shiver in that miserable cold. My 1974 Cadillac Sedan de Ville was large enough to fit them all. We then headed straight to the school three miles away. Mar Sargis Church, Chicago. Class of 1977. 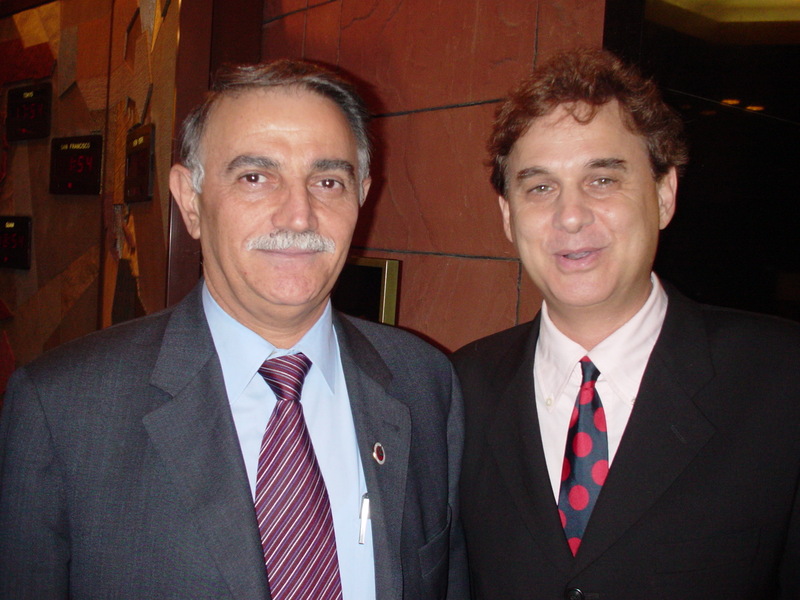 Standing from left to right: Reverend Barkho Oshana (then Shamasha) currently resides in Los Angeles. Third person- the ordained Shamasha Makarious; the fifth person, then ordained Shamasha (now) Fr. George Bet Rasho. The rest are currently living in Chicago, Phoenix, L.A. and Bay Area. 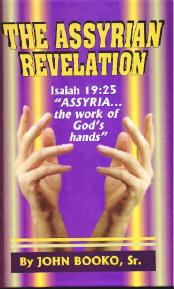 All are devoted Christians and truthful Assyrians. Photo by Author. Among our students, there were two who were very bright and were doing remarkably great, 13 and 14 years of tender age. Both were fully committed to serve the Lord. They both were later ordained Shamashe, the older is currently serving the Holy Altar at Assyrian Church of the East in Turlock – Modesto area, and his name is Shamasha Makarious. The younger one was ordained Shamasha in 1986 and then ordained Priest in 1996 and was named Father George Bet Rasho. Father George Bet Rasho marks his ninth year of priesthood service at St. Mary’s Assyrian Church of the East in Los Angeles. Today, his vision since his teenage years of establishing an Assyrian American school is becoming a reality. He needs our support. With $10 a month, we will have a share in that school. With $10 a month, we will keep that school’s door open for generations to come. So let us all fulfill our obligations. Let us all give our beloved Father George Bet Rasho a helping hand…. Let us add his name to the names of our great Assyrian school founders: Reverend Yousip De Kalaita, Mosul.... Reverend Khando, Baghdad… Reverend Odisho Beth Benyamin D’Asheeta, Sarsak, Northern Iraq…. Reverend Eskhaq Rehana, Kirkuk…His Holiness Mar Dinkha IV, Tehran…Assyrian Democratic Movement (Zowaa), Northern Iraq...His Grace Bishop Mar Meelis, Sydney.